Below are GPP Leverage Scores, a 4for4 proprietary metric created that indicates player value in tournaments after adjusting for projected ownership. A value above 1 indicates more exposure than the field is optimal and a value below 1 indicates less exposure than the field is optimal. Also included are a player's odds of hitting cash game value (cash game target score) based on implied volatility from that player's floor/median/ceiling projections. Learn more about GPP Leverage Score here. (Click headers to sort. 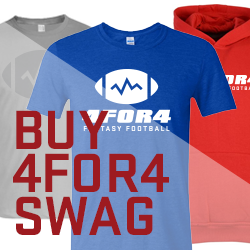 To order by GPP Leverage Score and position, click LEV header twice then POS header.) Updated daily.